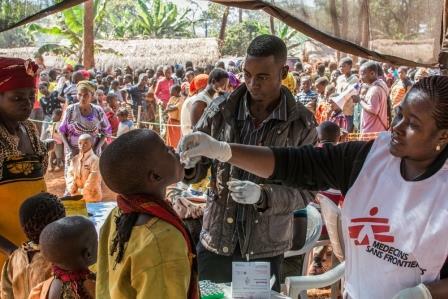 An oral cholera vaccination campaign to protect survivors of Cyclone Idai began this week in Beira, Mozambique. The campaign was funded by Gavi, the Vaccine Alliance, and will be carried out by the Mozambique Ministry of Health, with support from the World Health Organization (WHO) and other partners, including UNICEF, the International Federation of the Red Cross and Red Crescent Societies (IFRC), Médecins Sans Frontières (MSF) and Save the Children. Since the stockpile was launched in 2013, millions of doses every year have helped tackle outbreaks across the globe. In the fifteen years between 1997 and 2012, just 1.5 million doses of oral cholera vaccine were used worldwide. In 2018 alone, the stockpile provided 17 million of doses to 22 different countries. Since the beginning of 2019, more than 6 million doses have already been shipped to respond to outbreaks or address endemic cholera in many countries including Democratic Republic of the Congo, Nigeria, Somalia and Zimbabwe.